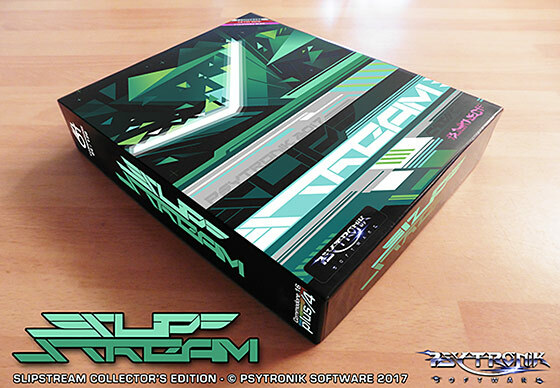 SLIPSTREAM is a visually stunning 3D shoot 'em up featuring fast polygon graphics, scrolling landscapes, animated backgrounds and great soundtracks. SLIPSTREAM is NOW AVAILABLE in three different formats for the C64. The COLLECTOR'S EDITION is presented in a stunning fully printed glossy box that contains the game on floppy disk, soundtrack CD, artwork stickers, a deluxe art card, badges, glossy game artwork poster + more! The BUDGET DISK EDITION features a 5.25" floppy disk presented in a full colour glossy disk-sleeve with a glossy disk label and printed instruction card. Please note that this is a special dual-format release and all the disks also include the full C16* + Plus/4 version of the game as well (*64K memory expansion required for C16 version). In the year 14634 the inhabitants of the Omikron system built a shielding system to protect their home planets from asteroid showers that regularly struck their world. Something went wrong. An energy burst detected near the shielding station caused the robots defending the system to malfunction. The robots began to classify whole planets in nearby star systems as asteroids and began attacking them. It was only a matter of time before they started attacking inhabited worlds. The SLIPSTREAM starship was constructed as a way of stopping the robots. Your mission is to take control of the Slipstream through a remote interface, find the missing robots and destroy them. Good luck, captain. · Awesome 3D polygon graphics. · Single or dual joystick control system.